As I covered in an earlier post on making a delicious Drunken Bourbon Chocolate Pecan Pie, I had wanted to make a couple of pies so I could see which one works. 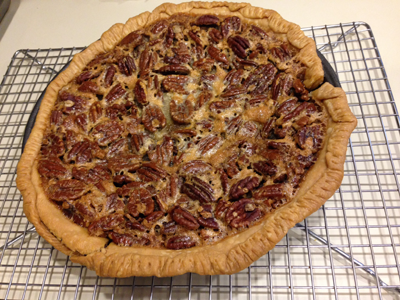 This recipe is a tamer bourbon pecan pie and was pronounced by my Louisiana-born brother-in-law as a “traditional bourbon pecan pie”. His thumbs up is a big endorsement, as far as I’m concerned, and I’m definitely willing to make either pie again. Unlike its drunken, chocolate-laced cousin, this doesn’t include pre-soaked pecans – so the bourbon flavor of this pie is more muted. This pie is more “Hi, I’m a pecan pie with a nice splash of bourbon in me” versus “HI MY NAME IS BOURBON AND CHOCOLATE AND LOOKIT HOW I BROUGHT PECANS AND PIE SHELL WITH ME.” In other words, pick your preferred recipe based on your personal desires. 2. Place the crust into a glass 9″ pie pan and flute, fork or otherwise decorate the edge however you typically like. (Note: cook times may be different for metal, so adjust as needed). 3. Melt the butter in the microwave; approximately 40 secs on HIGH power. 4. In a separate bowl, add the sugar, melted butter, vanilla, corn syrup, eggs, and bourbon. Stir well to combine. 5. 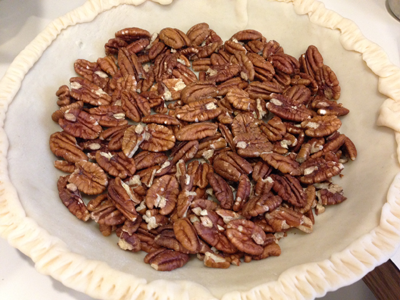 Place the pecans in the pie shell. 6. Evenly pour in the mixture from the bowl, over top of the pecans. 7. Bake for 10 mins at 375F, then reduce the heat to 350F and bake for an additional 20-25 mins until the pie is set. You can tell the level of “setness” by lightly shaking the pie side to side; if the filling jiggles as though the majority of it is still liquid, you need more time. It should only jiggle a little in the center, and then it will finish setting as it cools. If your crust starts to get too brown, I’ve heard you can cover just the edges with some foil…but I didn’t find that this was a problem for me. 8. Cool the pie on a wire rack before serving. 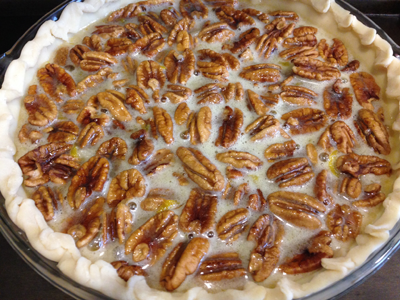 This entry was posted in desserts and tagged baking with bourbon, bourbon pecan pie, cooking with bourbon, dessert, pecan pie, pie by crunchymetromom. Bookmark the permalink.